There is a backstory to My Bones Are Singing, and although it’s not explicitly spelt out at any point on the album it’s so relevant that it can’t really be ignored. 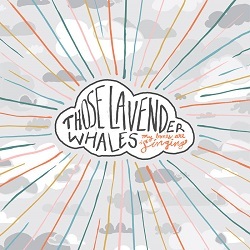 Before recording My Bones are Singing, Aaron Graves, who is Those Lavender Whales, had been diagnosed with a life threatening brain tumour. Knowing this puts an extra emphasis on the reflections on mortality that permeate the album – it’s not something that can just be dismissed as existential angst or a grappling with the awful inevitability of life’s ultimate destination. Not that there’s anything intrinsically wrong with making the conscious effort to consider one’s mortality – but in this case there’s nothing abstract about the undertaking. So when Graves sings “Oh my God I don’t know if I can handle this / Oh my God I’m not sure if you exist / Oh my God I feel like I’m talking to myself” then these are desperate prayers rather than mild exclamations of doubt. So, that’s the context in which these songs were produced and it’s heartening to note that they are actually shot through with a core of optimism as well as many intimations of dread. There’s a low-fi feel to these confessional songs, featuring Aaron Graves’ straight forward and honest vocals – in a happier mood he might be compared to Jonathan Richman – backed up with found sounds, waves of synthesized sound as well as drums, guitar and a little background banjo. It’s that peculiar thing – music with some depth that also sounds homemade and scratchy. How To Cook Everything flails wildly on rollers of fuzzed electric guitar as Graves sings of bringing down barriers and accepting more help “I wish that I could see through a different mind than I get to look / I think that I could be a little bit closer to my family / If I just did my best to let them stand a little closer to me” but instead of getting to that supportive place he ends up in a distorted and disturbing world of strangers where he encounters a symbolic metaphor for death “I saw the owl and it called my name”. Taken too straight a self-analysis such as this one undertaken under trying circumstances (to put it mildly) could be – and this time to put it bluntly – a real downer to listen to. Aaron Graves, though, has a light-hand, with profundities wrapped up in little tongue-twisting snatches of lyrics tripping out in a seamless stream – “Sometimes I think my body stops my mind from thinking not to do some things I’m not supposed to do / and I realise that everyone around me though I think they’re noticing they’re just continuing to be”. Then, sounding as if he’s still smiling, he sings a list of his devastating thoughts finally reaching “all of these things that I’m in love with one by one will peel away and will then be taken off of me”. Heavy, yes, but his thought balloons are full of helium so even this almost floats away in the time it takes to get your head around what he’s saying. Which is what makes this album so listenable. Thoughtful, intriguing, open, honest indie-folk album on one of life’s greater travails.